Alpine Communications is making a major investment by expanding their 100% fiber-optic Fusion Network to the community of Marquette and the Pleasant Ridge neighborhood this year. The state-of-the-art Fusion Network will provide a fiber optic connection to all businesses and households within the city limits of Marquette and to customers in the Pleasant Ridge neighborhood. What is Fiber-to-the-Home and why is it important? When is construction starting and what do I need to do? Construction of the network will begin in May and service activation will be completed throughout the summer and early fall of 2018. Residents will be notified before construction begins in their neighborhood. Alpine is requesting that all residents and business owners in Marquette, the Pleasant Ridge neighborhood, and throughout the Alpine service area register their interest for the Fusion Network at https://join.alpinecom.net. Alpine Communications will use the information they collect to strategically plan for expanding the Fusion Network. Alpine Communications is independently owned and steadfastly focused on our customers. Alpine has served this community since 1997 and you can count on them for reliability, responsiveness, and local customer service. As technology changes, Alpine changes along with it, keeping you connected to a new world of possibilities. For more information about the fiber project, contact Alpine Communications at 563-245-4000. Alpine Communications has invested millions of dollars in building the 100% fiber-optic Fusion Network throughout Northeast Iowa. 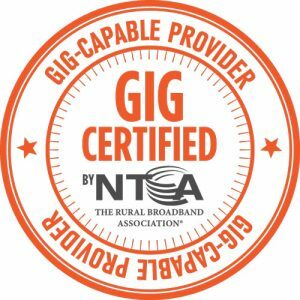 Because of this investment and commitment to rural Iowa, Alpine earned the certification and status as a Gig-Capable Provider by NTCA.